I was in a rush and entered hp 88 ink package into Amazon's search box so as to quickly find a set of inks which match my home printer. Last time I ordered inks from Amazon, each box of cyan, magenta, yellow and black came in a different package with lots of packaging material. Not only not green, but a terrible waste of money. This time I hoped to find a package of all 4 inks. The search results showed a package of inks and I clicked to learn more. Then I noticed this program running which tries to ascertain if the inks go with my printer. It turns out the Amazon search engine is not that good and this program saved me from getting the wrong inks and saved Amazon from having to waste money on shipping this item to me only to get it returned. 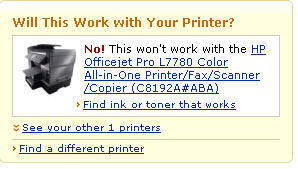 Thankfully I ordered my printer from Amazon as well which makes this whole process possible. It is the wonder of tech and in this case smart software which excites me most about my job. Simply -- being able to share sometimes simple innovations which can make us more efficient and productive is more exciting than I ever imagined. And it is the little things like this which show all corporations that technology, when used properly can help when the economy is slow. If you arbitrarily cut tech budgets you will likely miss out on the potential innovations which could save a million here or a million there. And yes... Sooner or later we are talking real money.